Address: Avenida Islas Canarias, 21-25, Costa Teguise (Lanzarote), Islas Canarias. Enjoy the year-round sunshine of Lanzarote with a stay in these charming, traditional-style apartments, set just 80 metres from the famous beaches of Costa Teguise. Self-catering apartments feature a 32-inch flat-screen TV with free international channels. All offer well-equipped kitchenettes and their own sun terraces. Some offer views of the sea. 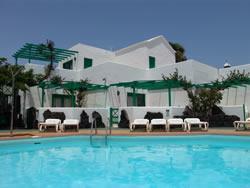 The whitewashed buildings of Apartments Celeste are located 3 minutes´ walk from the sandy beach of Las Cucharas, on Lanzarote’s well-known Costa Teguise. You will find a great selection of bars and restaurants within 30 metres of the apartments. Costa Teguise Golf Club is 5 minutes by car and Lanzarote Airport is 14 km away. Please inform Apartamentos Celeste in advance of your expected arrival time. You can use the Special Requests box when booking, or contact the property directly with the contact details provided in your confirmation. Before travel, all guests must inform the property of their flight number and anticipated time of arrival. This can be noted in the Comments box when booking, or by contacting the property directly using the contact details which appear on the Booking Confirmation issued by this site. Please note that the total amount will be charged upon arrival.